I've been meaning to make gingerbread men from scratch for a long time, which is why I added it to my Day Zero Project list. I blogged about making gingerbread men from ready made dough, and also about icing ready made gingerbread men. I did make a gingerbread house from scratch so perhaps that counts, but I really wanted to just make a batch of gingerbread men. I used a recipe which my Mum gave me. It's a good recipe because it is very simple, but the gingerbread men do also spread quite a lot when you cook them (somewhat resembling gingerbread clouds) so it wouldn't be a good recipe for anything that needs to hold its shape, like a gingerbread house. 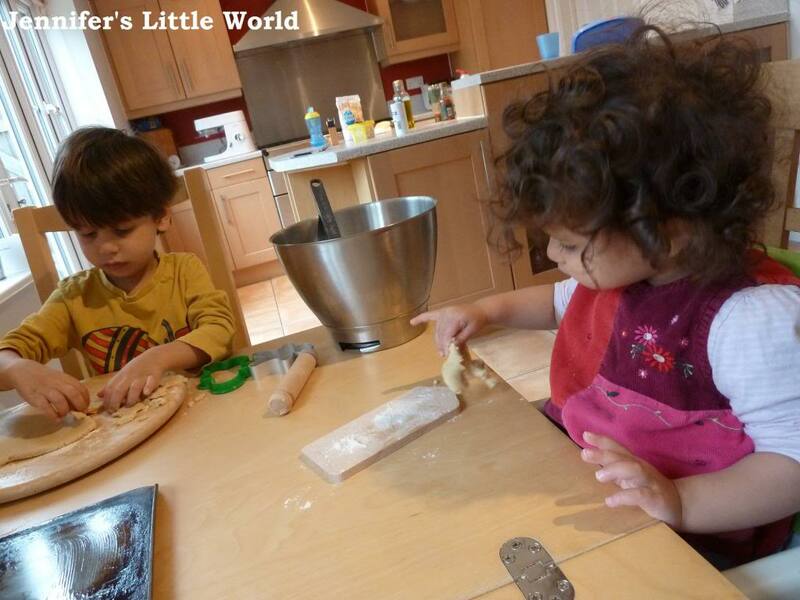 Mix the ingredients together, then cut into shapes and place on greaseproof paper on a baking tray. Make sure to leave some space between the biscuits. Bake at about 180C for about 7 minutes. Remove from the oven and leave to cool. We iced them with some royal icing and some sweets found inside the Christmas selection boxes. It made about 16 gingerbread men. 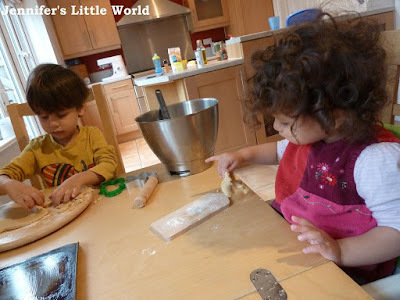 I find it quite difficult at the moment to come up with activities that I can do with both children. Mia still has such a short attention span, and will generally destroy anything that I'm trying to do with Harry. I gave her a bit of dough and a small board and rolling pin, and she just ate the dough really before getting bored and wandering off. Harry on the other hand worked really nicely and cut out all the shapes. When they had cooled we decorated them. Mia was more interested in eating the biscuits, I iced the details and Harry placed the buttons. I'm very proud of them! Thank you, I hope they turn out well for you!